The enthusiasm about aspiration tumbles out of the doors at Greenfields Primary School. There are too many awards to fit on one wall, so they’re spaced all the way up the main corridor on tables. This school is in the top one per cent of all schools in the whole country for pupil progress in reading and writing, and in the top three per cent for maths. But it was once a different story for the primary in one of the toughest areas of Kettering, which was on the verge of being placed in special measures for a couple of years before headteacher Sandra Appleby arrived in 2015. She’d not been through the doors more than a few months when Ofsted descended. The outcome of their inspection was good, but there were some clear objectives set out by inspectors. The school’s progress levels were significantly below average - which was a big deal when some children joining the school in reception were among those from the most deprived households in Kettering. There had been five headteachers in four years. “It’s very hard to climb out of that hole,” says Mrs Appleby. Two years beforehand and under a previous head, the school had joined the David Ross Education Trust (DRET) which Mrs Appleby says saved it from the threat of special measures. “I feel like my job is about stability and sustaining the high foundation we have been producing,” she says. The school doesn’t shy away from encouraging children to compete to get to the top. After all, says Mrs Appleby, modern schooling is about teaching children how they will need to behave out in the real world. “We’re very competitive,” she says. A red carpet is rolled out and children who have achieved something that week dance their way to the front of the hall. Earlier this month the school was given the prestigious School of the Year award by Northampton University’s Changemaker scheme which celebrates social innovation. And the school recognises that the only way to ensure pupils meet their full potential is to place itself at the heart of this community. 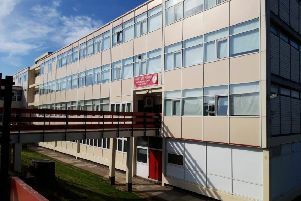 Although there are pupils from across a wide geographical area and large social spectrum, many come from the Highfield Road area around the school which has been hit hard by Government austerity measures. More than a third of pupils at Greenfields receive pupil premium - a pot of government money given to schools depending on how many children come from households with low incomes. In August last year, Greenfields was named the regional champion in the National Pupil Premium Awards for its innovative approach to supporting its most disadvantaged pupils. Claire Tyrell-Smith is deputy headteacher and Mrs Appleby’s right-hand woman. “We have families who bring in challenges beyond what you can ever imagine,” she says, adding that the school has a hands-on approach to doing whatever is necessary to make these children’s lives better. “We go into people’s homes because that’s what necessary sometimes to make a difference. Parents are encouraged to take an active role in school life. But for many, being physically present conflicts with their full-time jobs or other caring responsibilities. Enter: The Flipping Greenfields project. Parents are invited into school every Friday afternoon to see what their children are going to be learning about, which may be impossible for working parents. “So we created our own TV station,” says Mrs Appleby, “so parents can look at Flipping Greenfields on Youtube over the weekend and the teachers on there will explain what’s going on in class and how they can help their children be ready for what they’re going to learn on Monday morning. Key to the school are the members of support staff who live in the community, who understand those challenges more than most. Mrs Appleby says that when those children move from the familial environment at Greenfields, it’s important for them to have the tools to be independent. “We want those children to move to year seven with their own aspirations. We want to prepare them to have that resilience and to be able to overcome the difficulties they’ll face themselves. Although Greenfields has the same tough exam targets as all other primaries, this school places great emphasis on other subjects. A gardening club became involved in a groundbreaking national scheme which took pupils out of school and under the gaze of award-winning gardeners who taught them how to cultivate their own plots. Mrs Tyrell-Smith said: “(Back in 2013) we could have just made the decision to concentrate on maths and English. “But these children can never aspire to anything if they don’t know what opportunities are out there for them,” she said, describing with enthusiasm the Greenfest summer music festival the school held that was supported by the whole community`. While other schools are hunkering down in year six to produce high SATS results, Greenfields sends its year six pupils on an outward bound course because it knows relaxation and refreshment is sometimes as important to results as revision - particularly for children having a tough time at home. “Putting yourself in difficult positions and having the courage to go out there. “The outward bound is run by the Prince’s Trust and that opens up other opportunities way beyond what the local authority or the trust can offer. And on our walk around the school, we find children singing in their classrooms. Full-length mirrors in the corridors help them see if they look the part and keep uniform in check. Wall displays are replaced in some areas by coloured full-height boards and murals so teachers can concentrate on teaching rather than replacing peeling backing paper. A huge building project has provided a new entrance area. This school wants to give these children the best possible chance as early as it can, so its nursery has been extended to accommodate some more children of the many full-time working parents at the school. Earlier this month, the school held an open morning for other headteachers to come in and see for themselves how pupil premium money is spent. “A great deal of it goes on quality additional support staff, including an extra teacher,” says Mrs Appleby. And when Ofsted call, as they are expected to do so any day? “We’ll have to see, won’t we?” says Mrs Appleby.